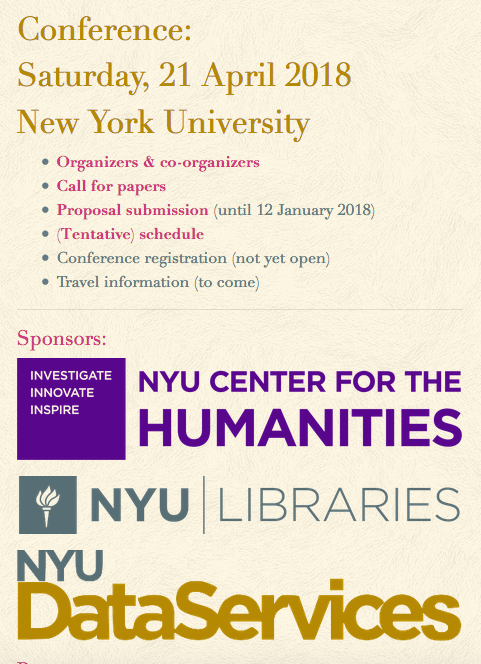 Proposals for papers and panels are now being accepted for the “Mapping the Text” conference occurring at New York University on Saturday, 21 April 2018. The conference will be held in conjunction with the annual CultureMapping@NYU event hosted at NYU Libraries on Friday, 20 April and sponsored by NewYorkScapes. The deadline for submissions to “Mapping the Text” is 12 January 2018. For information, contact conference-2018@mapping-the-text.org. The call for papers is available at mapping-the-text.org/conference/2018/cfp.